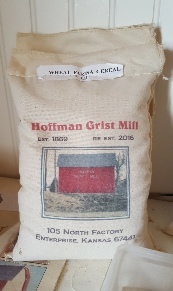 Situated next to the Smoky Hill River in Enterprise, KS, the Hoffman Grist Mill pays homage to Christian Hoffman (1826-1921) and his family. Mr Hoffman purchased the water power rights at Louden Falls in 1868. 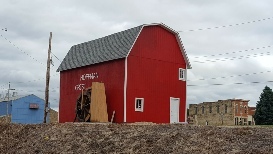 His first flour mill began operation at that location in 1869. 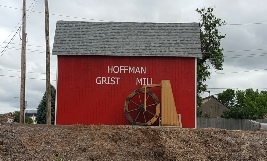 Mr. Hoffman named the town that grew around his mill “Enterprise”. A post office was established in 1873. 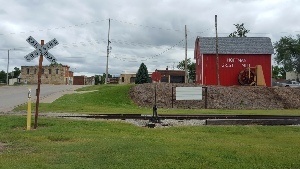 The flour mill, located at 105 N. Factory St. in Enterprise, KS, is open on Saturdays from 10am until 3pm and also on days that the Abilene & Smoky Valley Railroad operates trains to Enterprise. Train passengers are invited to visit the flour mill during the train’s layover in Enterprise to explore the mill, see how it operates, and make purchases. 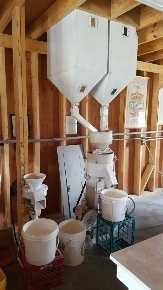 Flour produced in the mill may also be ordered and shipped to your home. just like it was in the late 1800’s! Orders are ground as received for freshest product. contact information and for additional details on products, prices, and shipping.